ANDREW JACKSON. Broadside. 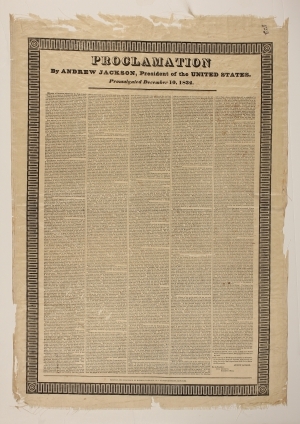 Proclamation, By Andrew Jackson, President of the United States. New York: Marsh & Harrison, . Large broadside on silk, text in 5 columns, surrounded by an ornamental border. 19 x 26 in. 1p. The Nullification crisis was a foreshadowing of the sectional divisions that ultimately brought on Civil War. Opposition to protective tariffs enacted by Congress in 1832 grew to such intensity, particularly in the South, that in November 1832, South Carolina adopted a Nullification Ordinance proclaiming the Federal tariffs void in that state as of February 1, 1833. While Congress granted Jackson emergency powers to employ the Army and Navy if necessary, the crisis was narrowly averted. Before the Ordinance of Nullification went into effect, Congress enacted a Compromise Tariff in 1833 that was sponsored by Clay and acceptable to both Jackson and the South. South Carolina promptly rescinded the Ordinance of Nullification, but afterwards, Calhoun and others argued that their actions had been justified and were in accordance with the principles of the Constitution. The first broadsides of this Proclamation were printed on paper in Washington and followed by several additional printings on silk in such cities as New York, Boston, and Philadelphia. Fraying and some loss to margins. Minor tears and abrasion to the text area.